The Mainz vertical wind tunnel allows one to freely suspend various hydrometeors as for example rain and cloud drops, ice particles, and snow flakes in a vertical air stream so that no wall effects are to be expected. As the hydrometeors are levitated at their terminal velocities the ventilation coefficients are in the real-atmospheric order. In the wind tunnel single events with individual hydrometeors are observed. Environmental conditions such as air speed, temperature, humidity and depending on the study, concentrations of trace gases or aerosol particles are controlled exactly and continuously recordered. To perform experiments with the ice phase the wind tunnel air can be cooled down to -30°C. The air humidifying is possible up to the saturation level. The air speed can reach values up to 40 m/s; allowing the whole range of hydrometeors, starting with small drops having radii between 30 und 500 µm, large drops with equivalent radii up to 3 or 4 mm, ice crystals, snow flakes, graupels and even large hailstones, can be floated. The Mainz vertical wind tunnel is therefore an outstanding tool for microphysical and chemical investigations of hydrometeors. During INUIT-1 we have investigated the impact of ice nuclei on mixed-phase convective clouds. Experiments of immersion and contact freezing were carried out by means of the Mainz vertical wind tunnel and an acoustic drop levitator. During INUIT experiments, the acoustic levitator was installed inside a walk-in cold chamber at ambient temperatures down to -30°C. Inside the levitator a standing ultrasonic wave is produced by interference where drops can be floated at the nodes (Diehl et al., 2009). The set-up further includes a platinum-resistor thermometer Pt100 to measure the ambient temperature, a digital video camera to observe the freezing process and to determine the drop sizes, and an infra-red thermometer to directly and contact-free measure the surface temperature of the freezing drops. The transition from the liquid to the ice phase was clearly defined by a sudden increase of the drop temperature recorded from the infra-red thermometer. In the Mainz wind tunnel drops of sizes from 680 to 760 micron in diameter were freely floated at their terminal velocities in the vertical air stream. Thus, ventilation and heat transfer were similar to the situation as in the real atmosphere. The onset of freezing was determined by direct observation. It is characterized by an opaque look of the drops and a different floating behavior. 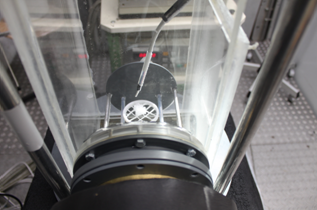 Contact freezing experiments were performed in the acoustic levitator at constant temperatures lowered in steps of 1K. At each temperature, individual drops were placed in the levitator and supercooled to the ambient temperature which was reached after 10 to 30 s. Afterwards, the selected particles were blown as one burst onto the drop surface. If a drop did not freeze it was removed and counted as unfrozen, and afterwards, the next drop was injected. 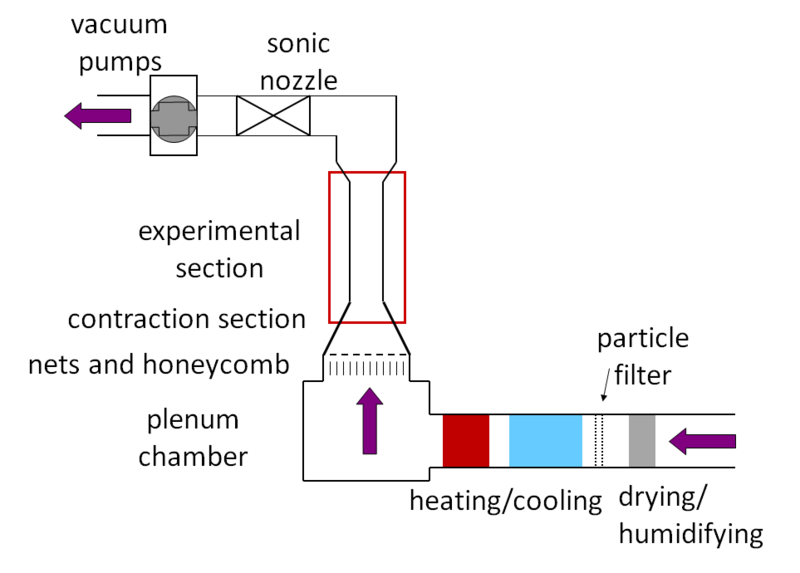 Immersion freezing experiments were studied with both methods (i.e. acoustic levitator and wind tunnel). The drops were formed from solutions which contain the selected particles in defined concentrations. In the wind tunnel, the experiments were performed isothermal at constant ambient temperatures, i.e. the wind tunnel was pre-cooled to certain temperatures. Single drops were injected into the wind tunnel and freely floated for approximately 40 s. Drops which did not freeze within this timed period were counted as unfrozen. For experiments in the acoustic levitator, the cold chamber was pre-cooled to low temperatures corresponding to the expected lowest freezing temperatures. Individual drops were levitated one after another and cooled down until they froze. As first test ice nuclei in the acoustic levitator montmorillonite K10 and KSF (from Sigma Aldrich) were used and mica particles generated from a sample which was part of a collection of natural minerals available in the wind tunnel laboratory. The majority of the experiments were performed with the INUIT test aerosols SnomaxTM, K-feldspar, and illite NX, besides another type illite IMt1. In all cases, polydisperse particle samples were used. Experiments with the INUIT test aerosols in the immersion mode were performed with both techniques. The results from the contact freezing experiments showed that for same particle types the freezing temperatures were dependent on the mean particle sizes. It was concluded from comparison to results obtained with monodisperse particles that contact freezing was always affected by large particles in the size spectrum in the latter case. However, it has been found that the contact freezing experiments during INUIT-1 do not contribute much to the understanding of contact freezing as it is not possible to calculate the numbers of collisions between drops and particles. Therefore, this type of experiments will not be continued in INUIT-2 but will be replaced by wind tunnel experiments in a more realistic manner and the collision rates will be determined. The immersion freezing results of mineral dust were evaluated in terms of particle surface area per drop which were calculated from the particle concentrations in the stock solution and the average drop sizes. The particle surface areas per drop ranged from 7 × 10-7 to 2.5 × 10-4 m2/drop. Regarding SnomaxTM, the results were evaluated in terms of particle mass per drop ranging from 1 × 10-9 to 1 × 10-3 mg/drop. Based on the frozen fractions of drops as measured during the experiments, the surface densities of actives sites per unit area (mineral dust) or the numbers of active sites per unit mass (SnomaxTM) were. A comparison of the results from the two methods used in this project indicates a very good agreement. An example is given in the Figure below for illite NX. Surface densities of active sites as function of temperature determined from wind tunnel (WT) and acoustic levitator (AL) measurements for various particle surface areas per drop. In tropospheric mixed-phase clouds where ice particles and supercooled droplets are present simultaneously, precipitation is mostly initiated via the ice phase. Ice particles grow to precipitation sizes at the expense of liquid drops either by the diffusion of water vapor or by riming. Riming means the growth of ice particles by the deposition and subsequent freezing of supercooled liquid droplets and leads to the formation of graupel or hailstones. To estimate graupel formation and precipitation rates the knowledge of the collection kernel (collection efficiency × volume swept by the collector per unit time) of involved ice particles and liquid droplets is essential. Experiments on the riming of graupels were performed in the wind tunnel in a temperature range from -8 to -12°C and with liquid water contents lying between 0.9 and 1.6 g m-3, i.e. values typically found in mixed phase clouds. Individual ice particles with initial radii of 350 µm were freely suspended in the wind tunnel while a cloud of supercooled droplets was generated upstream by a number of sprayers. Thus, the ice particles grew by collision with the droplets which had a mean volume radius of 15 µm. After sufficient growing times the rimed graupels were extracted from the wind tunnel and the mass increase was determined. From the mass increase and the liquid water content the collection kernel of the graupels was calculated. Together with earlier experiments performed with average droplet radii of 6 and 10 µm, respectively, the graupel collection kernels were compared to theoretically determined collection kernels for liquid drop collectors. The collection kernel indicates a power law dependence on the collector momentum (mass × fall velocity) but is independent of ambient temperature, liquid water content, and growth time. Thus, parameterizations are given where the collection kernel is a function of the collector momentum. Similar to earlier parameterizations of liquid drop collection kernels, new parameterizations of graupel collection kernels were obtained from the wind tunnel measurements. 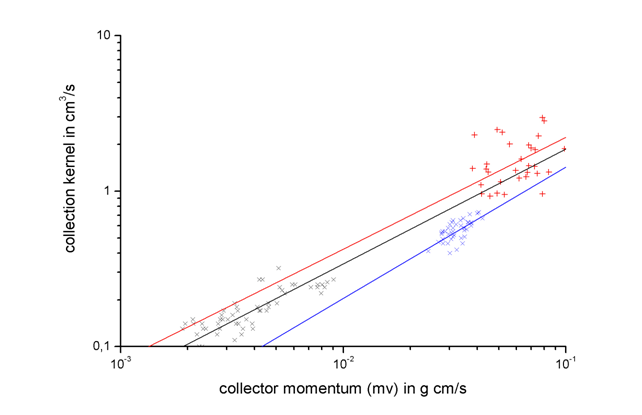 Collection kernel of graupels as function of collector momentum. Blue and black symbols: 6 and 10 µm droplets (Pflaum and Pruppacher, 1979); red symbols: 15 µm droplets (v. Blohn et al., 2009); lines: regression curves from experimental data. The comparison shows that the graupel collection kernels are enhanced as compared to liquid drop collector kernels and the enhancement increases with the size of the collected droplets. A general reason for the enhanced collection kernel lies in the fact that riming graupels move irregular so that they sweep out a larger volume than collector liquid drops during collisional growth. The increase of the enhancement is affected by surface protrusions on the graupel surface which produce local flow deviations around the graupel so that more droplets are captured. Because of the increase in inertia this effect increases with collected droplet size. An enhancement factor was obtained from the measurements to modify collection kernels in cloud models describing the riming process. The liquid droplets taking part in the riming process contain, according to the circumstances, more or less water-soluble trace substances. During freezing a fraction of the dissolved trace substances remains in the ice phase. This effect is called retention and it is an important process which quantifies the partitioning of atmospheric trace substances between the phases. Wind tunnel experiments were performed to determine the retention of formic acid (HCOOH), acetic acid (CH3COOH), oxalic acid ((COOH)2) and malonic acid (CH2(COOH)2). The droplets containing well-defined concentrations (5 mg/l) of the trace substance were injected into the wind tunnel via two sprayer nozzles. Their mean volume radius was 14 μm. The measured LWC ranged from 0.9 to 1.6 g m-3 and the examined temperatures ranged from -16 to -7 °C. In the experiments two types of rime collectors were examined: ice particles (graupels) and snowflakes. The ice particles were captively floated, i.e. they were hung up on a thin nylon fiber (80 μm in diameter) where they could move in the airstream. The snowflakes were placed on a coarse meshed net out of the same fine nylon fibers. Heat conduction along the very thin fibers could be neglected. The diameters of the ice particles were 6 mm and the diameters of the snowflakes ranged from 10 to 15 mm. The rime collectors were positioned in the center of the experimental section of the wind tunnel within the airstream containing the supercooled droplets. The wind speed was similar to the terminal velocities of the rime collectors. After riming the melt water of the rime collectors was analyzed by ion chromatography. From the concentrations of the trace substances in the ice and liquid phase the retention coefficients were calculated. Shown is the insulated box which is fixed at the wall of the experimental section of the wind tunnel. The rime collector is exposed in the center of the section and, thus, in the cloud of supercooled droplets. The temperature is measured downstream of the rime collector. As result all four acids are independent of temperature. The mean retentions were 73 ± 7 % for formic acid, 69 ± 5 % for acetic acid, 98 ± 3 % for oxalic acid, and 98 ± 4 % for malonic acid. The present and earlier results from wind tunnel studies (v. Blohn et al., 2011; 2013) indicate that high H* values affect high retention coefficients. This is the case for the di-carboxylic acids ((COOH)2) and CH2(COOH)2) and for hydrochloride and nitric acid (HCl and HNO3) where the retention coefficients were measured as 1. Their retention is dominated by strong solubility and dissociation so that the ions are hardly able to leave the liquid phase. The mono-carboxylic acids (HCOOH, CH3COOH) are characterized by lower H* values and, thus, their retention coefficients are lower. Because these substances are less dissociated they are rather released back to the gas phase than incorporated into the ice; the retention is more sensitive to other factors such as ambient temperature, liquid phase concentration, and shape of the rime collector which affect the rate of latent heat removal from the rimed surface. Radar polarization measurable quantities are sensitive functions of raindrop size and shape which is generally characterized by the drop axis ratio. Drops with radii larger than 0.5 mm are no longer spheres but show the shape of oblate spheroids. They start to oscillate, in the beginning with high frequency and small amplitude. With increasing drop size the oscillation frequency decreases while the amplitude increases. These changes of the drop shape are greatly important for applications in radar meteorology. With the drop shape the internal circulation is also changing from a fixed scheme to a turbulent mixing; this influences the uptake of trace gases. The internal circulation of cloud and raindrops as well as the shape and oscillation of raindrops with radii up to 3.5 mm were investigated with a high speed video camera (Szakall et al., 2009; Thurai et al., 2009; Szakall et al., 2010). Drop-drop collision experiments are carried out at the vertical wind tunnel and the oscillation parameters of the colliding drops are investigated. Larger drops are freely floated at their terminal velocities while smaller droplets, carried along with the air stream, are colliding with them. These collisions result in coalescence and filament break-up events. The oscillation behavior of the drops is recorded by a high speed video camera with 2000 frames-per-second and evaluated by frequency analyses. DeMott, P. J., O. Möhler, D. J. Cziczo, N. Hiranuma, M. D. Petters, S. S. Petters,..., M. Szakáll, et al. : The Fifth International Workshop on Ice Nucleation phase 2 (FIN-02). 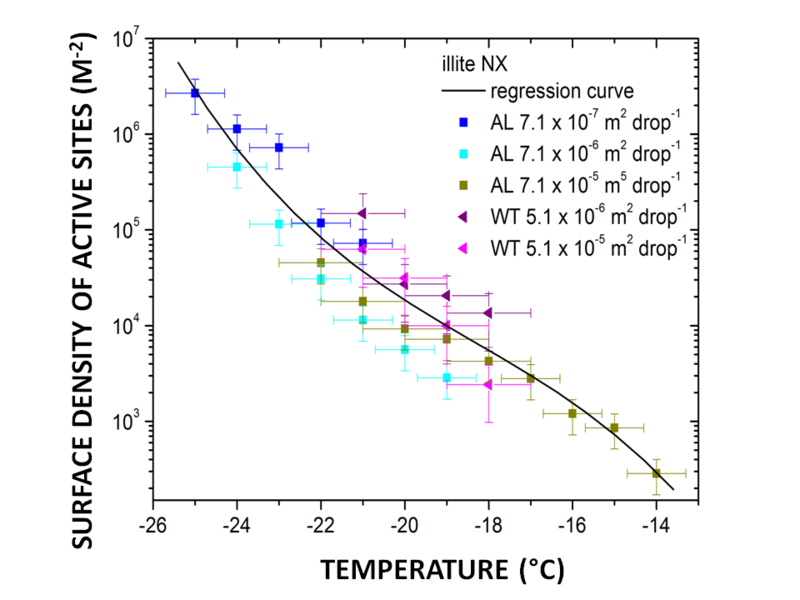 Laboratory intercomparison of ice nucleation measurements. Atmos. Meas. Tech. 11 (11), 6231–6257. doi: 10.5194/amt-11-6231-2018 (2018). Heymsfield, A., M. Szakáll, A. Jost, I. Giammanco, and R. Wright: A comprehensive observational study of graupel and hail terminal velocity, mass flux, and kinetic energy. J. Atmos. Sci., 75 (11), 3861-3885 (2018). M. Szakáll and I. Urbich: Wind tunnel study on the size distribution of droplets after collision induced breakup of levi-tating water drops. Atmos. Res., 213, 51-56 (2018). Jost, A., M. Szakáll, K. Diehl, S. K. Mitra, and S. Borrmann: Chemistry of riming: the retention of organic and inorganic atmospheric trace constituents. Atmos. Chem. Phys., 17, 9717-9732 (2017). Szakáll, M., S. Kessler, K. Diehl, S. K. Mitra, and S. Borrmann: A Wind Tunnel Study of the Effects of Collision Processes on the Shape and Oscillation for Moderate-Size Raindrops. Atmos. Res., 142, 67-78, doi: 10.1016/j.atmosres.2013.09.005 (2014). Müller, S., Szakáll, M., Mitra, S.K., Diehl, K., and Borrmann, S.: Shapes and oscillations of raindrops with reduced surface tensions: Measurements at the Mainz vertical wind tunnel. Atmos. Res., 119 (2013). 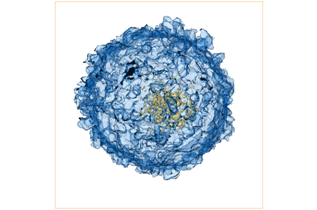 Diehl, K., and Wurzler, S.: Air parcel model simulations of a convective cloud: Bacteria acting as immersion ice nuclei. Atmos. Environ., 44, 4622-4628 (2010). Diehl, K., Debertshäuser, M., Eppers, O., Schmithüsen, H., Mitra, S.K., and Borrmann, S.: Particle-area dependence of mineral dust in the immersion mode: investigations with freely suspended drops in an acoustic levitator. Atmos. Chem. Phys. Discuss., 14, 12887-12930, doi:10.5194/acpd-14-12887-2014 (2014). Szakáll, M., Diehl, K., Mitra, S.K., and Borrmann, S.: A wind tunnel study on the shape, oscillation and internal circulation of large raindrops with sizes between 2.5 and 7.5 mm. J. Atmos. Sci., 66, 755-765 (2009). Szakáll, M., Kessler, S., Diehl, K., Mitra, S.K., and Borrmann, S: A wind tunnel study of the effects of collision processes on the shape and oscillation for moderate-size raindrops. Atmos. Res., 142, 67-78 (2014). Szakáll, M., Mitra, S.K., Diehl, K., and Borrmann, S.: Shapes and oscillations of falling raindrops – A review. Atm. Res., 97, 416-425 (2010). v. Blohn, N., Diehl, K., Mitra, S.K., and Borrmann, S.: Wind tunnel investigations on the growth rates and regimes, and the collection kernels during riming. J. Atmos. Sci., 66, 2359-2366 (2009). v. Blohn, N., Diehl, K., Nölscher, A., Jost, A., Mitra, S.K., Borrmann, S.: The retention of ammonia and sulfur dioxide during riming of ice particles and dendritic snowflakes: laboratory experiments in the Mainz vertical wind tunnel. J. Atmos. Chem., 70, 131-150 (2013).